It was about a month ago that we pulled the Biotruck up to a gas station off the highway for the night. It was a perfunctory stop, determined by the encroaching darkness and our no-driving-after-sunset rule. We ate a quick dinner and, feeling uninspired, laid down for sleep. About 30 minutes later, I heard loud music and peered out the bus window. In a field across the highway was a giant tarp enclosure. Wary of guidebook attractions, it’s usually these type of mysterious developments that make this expedition the idiosyncratic long strange trip that it is. I pulled on some clothes, and went across the road to investigate. I rounded the tent in the dark, and soon could hear music and the unbounded cheers, laughs, and shrieks of children. A row of vendors sold fishballs and kabobs, and tended spitting vats of fried bananas. I ducked past the ticket taker and stood at the tarpaulin doorway. Inside, the arena was flooded by a spotlight that seemed to carve a circumference of daytime in the black night. At its center, three majestic elephants lumbered down into to a kneeling position, each with several children straddled across its backs. The audience roared approval, and carnival music cranked into the sky from bad speakers. The elephants’ eyes glimmered in the light, sea-deep and a thousand leagues away. I held my open palm in the air. I don’t know why. Something I do whenever I feel helpless. A few years ago, I was asked to write a magazine article about the Elephant Sanctuary in Hohenwald, Tennessee. Though the Sanctuary is known as a happy place—a sort of pachyderm retirement home where 14 rescued elephants roam unbothered on 2,700 acres, the circumstances that prompted my story were grim. One of the Sanctuary’s caretakers, Joanna, had worked with an elephant with the innocuous name of “Winkie” for over six years. But on one particular day she was performing an eye exam when Winkie knocked her down, stepped on her, and killed her instantly. Joanna’s death was a devastating shock and prompted researchers to find an explanation. It was scientist Gay Bradshaw (of Oregon’s Applegate Valley) who pointed to the possibility of Post Traumatic Stress Disorder. Her theory was this: that Winkie’s violent outburst was a flashback, similar to what any war veteran might experience. Bradshaw’s reasoning added up: like a veteran, Winkie had a troubled past. Before arriving at the Sanctuary, she’d endured the torture of being kept as a zoo elephant—taken from her mother early and forced to endure years of confinement, harsh training techniques, and sensory deprivation. 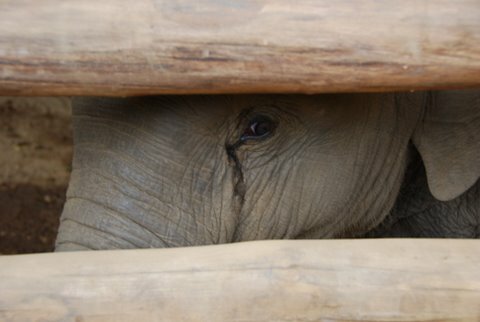 The media caught on and everywhere articles popped up addressing the possibility of PTSD in elephants. Are we Driving Elephants Crazy? asked the New York Times. Carol Buckely, the Sanctuary’s founder, was not surprised. She’d long known elephants to be hugely advanced and highly sensitive—the terrestrial equivalent of a whale. They are extremely social, forming tight friendships and engaging in complex communication. Like humans, they experience an array of emotions from happiness to anger. They also mourn their dead. My worldview has always accommodated the idea that animals are complex, emotional and more like us than not. Who hasn’t seen a dog look bored, excited, sad, or fearful? For their insight, for their outspokenness, for their love of what is not-human, Buckely and Bradshaw fast became my heroines. So, it was amazing in northern Thailand to run into Carol Buckely at the Elephant Nature Park outside of Chiang Mai. I was on as assignment writing about elephants again, and was interviewing Lek Chailert, a pixie-sized Thai woman who has been single-handedly changing the treatment of elephants in Thailand. Her 2000-acre refuge is home to over 34 rescued elephants. Buckely was there performing elephant foot care and training one of the babies. I sat on a hay bale and watched on as she taught the young elephant how to lift his foot for a veterinarian exam. I tentatively asked her how, four years later, she was coming to terms with Joanna’s death. She seemed resolved and upbeat. Horrible as it was, she explained, there have been some positive outcomes; the tragedy brought awareness to the abuses of zoos and circuses, and also reframed the way the public viewed elephants—appreciating more their complexity. “If Joanna knew that her death was used in this way, she would be so pleased,” Buckely said. We sat up late that night, and Carol shared stories of her own former circus days, the way she toured with her elephant Tarra. She told of the awakening she’d had when a spectator accused her of abusing Tarra by making her rollerskate. When the message sunk in, Buckely hung Tarra’s 50 lbs. skates up forever. Soon after, she purchased land in the subtropical banana belt of Tennessee to provide a refuge for abused zoo and circus elephants. She is away from the Sanctuary now, and is making the best of her time by setting up elephant care centers in Asia. The hardest part of being in Asia is being separated from her elephants–especially Tarra, who she’s spent so many years of her life with. A friend of mine did a mediation, she explained to all of us circled around the table. She said that in her meditation, Tarra told her that she could understand what I felt even when I spoke without moving my lips. A veterinarian at our table then started talking about plant-spirit medicine and the difficulty of practicing in a scientific world. Everyone at the table seemed rapt, including me I guess, because later Andy, ever the skeptic, would say you really seemed to eat that up. Did I? I replied. I was surprised. Though I’ve always had a deep belief in Nature, I’ve been more than wary of woo-woo type spirituality. One Halloween I dressed as a New Age charlatan called “Frauda”–a costume that was borderline offensive in a town that’s home to Jean Housten, Neal Donald Walsh, and Ecstatic Dance. Had I gotten all new-agey without even noticing it? I walked back around the tent, raising up my hand and offering another one of my feeble blessings. At the end the day, what left is there to do? Did you know squid experience jealousy? I inquire whenever a friend raises a forkful of calamari to their lips. I yell at people who hit dogs, and have occasionally opened bird cages. Last year, hitchhiking along a remote Himalayan road, I waved off a rare ride when a truck crammed with stumbling water buffalo stopped to pick me up. These things have annoyed a lot people, but haven’t changed a single thing—not even in my own behavior. Like tonight, when I polished off a plate of cashew chicken. I took that as a compliment and lapped up the validation. So many times, I’ve been told that I over-react—like when my grandpa and I put out a fishing line overnight and pulled up the bowed rod the next morning only to find we’d hooked a turtle. I was undone. Christina, you are too sensitive, said my grandmother. I laid awake in the Biotruck bed. Please may humanity wake up I prayed to no one in particular, knowing that I was dealing with forces were probably too great to be stopped: the stream-roller of commerce, the deep-set traditions, the congenital cruelty. So, I keep doing it, raising my hand up, blessing things, feeling half-silly, but hoping there is a little room left for some magic to happen, a collective awakening of the sort that Carol had when she hung up Tarra’s skates for the last time. I don’t believe much in prayer, but I pray for elephants.